서예(書藝)라는 한자어를 직역하면 ‘글씨의 재주’라고 할 수 있다. 그러나 글씨의 재주란 단순히 기교만을 일컫는 것은 아니다. 한 획 한 획 숨을 가다듬고 조심스럽게 써내려가는 글씨에는 붓을 쥔 이의 심성과 성정이 고스란히 배어든다. 글씨란 곧 그 사람과 같다는 ‘서여기인(書如其人)’이라는 말이 여기서 나온다. 때문에 서예를 하다보면 흔들림 없이 단단해져가는 마음을, 차분하고 맑아지는 자신의 영혼을 들여다 볼 수 있다. 서예란 결국 마음의 수련인 것이다. 흐트러진 마음으로 서예를 하게 되면 팔의 진동을 느낄 수 있다. 마음의 어지러움은 팔의 떨림을 타고 나가 붓의 흔들림으로 드러난다. 글씨가 자신의 마음을 담아내는 것이라면, 흔들리는 붓 또한 자신의 모습과 닮아있다고 말할 수 있다. 수십여 년간 자신의 글씨를 닦아온 서예가이자 전업 작가인 경산(鏡山) 김시현 작가의 붓에는 흔들림이 없다. 대신 그의 붓은 요동치는 생명력과 힘으로 마치 살아 움직일 듯 꿈틀거린다. 김시현 작가는 자신이 추구하는 서예란 곧 ‘기운생동(氣韻生動)’이라 말한다. 비록 현대회화처럼 다채로운 색으로 화려함을 뽐내진 못하더라도, 붓이 가진 고유한 힘과 생동감이 보는 이로 하여금 고졸한 문기(文氣)를 느끼게 하는 것이다. 이러한 점에서 그의 글씨는 ‘書’보다는 ‘文’에 닿아있다고 볼 수 있다. 형식에 얽매이지 않고 글자 안에 숨어있는 의미를 찾는 것에 더욱 집중하는 까닭이다. 김시현 작가가 서예에 뜻을 두게 된 것은 경북 안동의 유가(儒家)에서 태어나 조부님의 글씨 쓰는 모습을 보며 자랐던 영향이 크다. 대학에 진학한 뒤 서예가 자신의 길이라 생각한 그는 이름난 서예가들을 찾아다니며 배움을 청했다. 한때 학업과 취업에 쫓겨 서예에 매진하지 못했던 때도 있었으나, 이내 자신의 뿌리를 찾아가는 서예로 되돌아가 지금에 이르렀다고 한다. 이후 그는 대한민국미술대전 서예부문 초대작가이자 심사위원을 역임한 바 있으며, 한국미술협회 서예분과 이사, 현재는 대구미술협회 서예분과 위원장을 맡고 있다. 2014년과 2016년 두 차례의 개인전을 가졌으며, 중국과 일본, 대만을 오가며 수십여 회에 걸친 국제 교류전에 참여하기도 했다. 김시현 작가는 요즘 사람들이 서예를 ‘낡고 오래된 것’, ‘현시대와는 맞지 않는 것’으로 치부하는 것에 안타까움을 표했다. 그는 “서예는 동양정신의 정수입니다. 동양의 수많은 철학과 글이 바로 ‘붓’에 의해 쓰였습니다. 그 글씨 속에는 동양의 정신세계가 남아있습니다”라고 말했다. 서예가 추구하는 인내심과 평정심은 모든 것이 빠르게 변화하는 시대를 살아온 현대인들에게 낯설고 생소하게 느껴질 수 있다. 그러나 김시현 작가는 오히려 서예의 이러한 면이 현대인들에게 마음의 안식과 휴식을 되찾아주는 좋은 방법이 될 수 있을 것이라 말했다. 그는 “각박한 사회 풍토 속에서 많은 이들이 삶에 지치고 힘들어하고 있습니다. 이러한 이들에게 서예는 자신의 내면을 들여다보고, 새로운 자아와 마주하는, 그리고 조급함에서 벗어나 평안함을 얻는 기회가 될 수 있습니다”라고 조언했다. 과거 대장암 3기 판정을 받고 항암치료를 경험했을 때나, 지난해 혈액암 선고 이후 긴 투병생활에 지쳐있을 때, 이를 극복할 수 있었던 이유는 바로 ‘붓’을 쥐고 있었기 때문이라는 게 그의 생각이다. 이에 덧붙여 그는 서예를 포함한 문화예술 장르가 발전하기 위해서는 일반 대중들 뿐 아니라 국가의 관심과 지원이 필요하다고 강조했다. 특히, 최근 그 비중이 점차 낮아지고 있는 한자교육에 대한 인식의 제고가 이뤄져야만 한다고 말했다. 김 작가는 “서양의 고전문학과 역사를 공부하기 위해서는 라틴어를 배워야 하듯, 우리 문학과 역사, 정신을 제대로 이해하기 위해서는 우리말 어휘의 대부분을 차지하는 한자어에 대한 학습이 필요합니다”라며, “한자어 학습은 우리들의 정신세계에 대한 깊이 있는 이해를 위해서도 중요한 요소입니다. 정신세계가 깊어져야만 글로벌 시대의 핵심가치인 창의성도 발현될 수 있다고 생각합니다”라고 의견을 피력했다. 또한, 이에 덧붙여 “문화예술 분야는 단기적인 투자로는 성과를 확인하기 어렵습니다. 하지만 세계와 경쟁할 수 있는 힘은 바로 가장 한국적인 것에서 온다는 사실을 명심하고 중장기적인 관점에서의 투자와 지원이 이뤄지길 바랍니다”라고 당부의 말을 남겼다. Your hands shake when writing with a brush in disorderly mind as the vibration travels down to the brush through the hand from your inner world. Calligraphy reflects the mind of the calligrapher. Will the phenomenon apply to a master calligrapher? The answer is ‘no’. Because decades of practice has trained the mind of the master calligrapher Gyeongsan Kim Si-hyun to hold his brush firm and it is hard to find any hint of shake or tremble on his hand. Instead, his hand moves freely with energy and vitality as if the words are alive. And these elements - energy and vitality – are what make calligraphy a unique form of art despite the fact that the art uses only black ink on white paper. Kim’s calligraphy, in this respect, is about ‘force of the words’, rather than ‘words’ themselves. The difference between ‘force of the words’ and ‘words’ is that the former intends to find the hidden meanings of the words. Kim was born in Andong and grew up by watching his grandparent writing letters with a brush. But he did not realize that he was destined to be a calligrapher until he went to university. His mind being set, he traveled wide in seeking of renowned calligraphers to learn the skills and, as a result, has become as great a calligrapher himself as today. Kim was invited to serve as a judge of the Grand Exhibition of Korea in the category of calligraphy and a board member of the Korea Fine Arts Association. 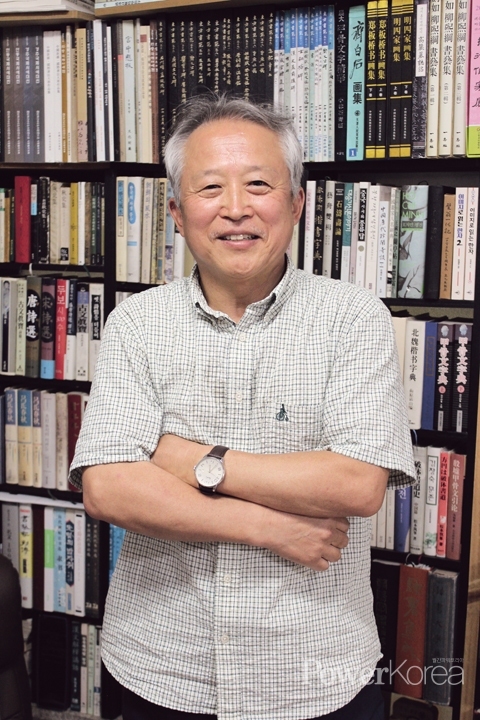 And he currently is serving as the director of the calligraphy division of the Daegu Fine Arts Association. He has held two solo exhibitions in 2014 and 2016 respectively and participated in numerous international exchange exhibitions in China, Japan and Taiwan. It is regretful for Kim to witness that some of busy modern people prejudice themselves that calligraphy is an old and boring stuff. In fact, calligraphy is the essence of oriental art and spirit. A lot of oriental classics are written by this art of writing and one can see the spirit still alive in the books today. It is the art of slowness and the art of finding peace of mind. In this respect, there seems to be nothing better than calligraphy to train oneself to control the fastness-driven busy modern set of mind. Kim suffered from a colon cancer in the past and a blood cancer again a year ago. 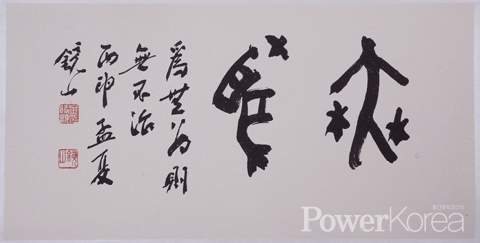 Alongside the anticancer treatment, Kim looks back, calligraphy played a crucial role to overcome the diseases. <Power Korea> sends a message of support.